Where do I find prices for individual products? Individual product prices can be found by clicking on the desired part within each product category on our website or by downloading a PDF of the product catalog from the website. How do I request a catalog or price list? You can download and print a product catalog by going to the Product Catalog widgets on the website and click the link or call us at 508-869-0373. 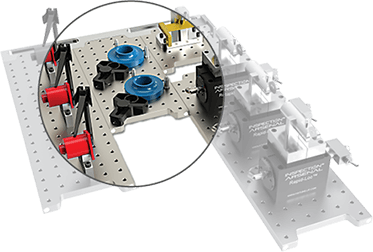 How do I purchase Inspection Arsenal™ Workholding and Fixture Plates? The Inspection Arsenal™ products are sold by Phillips Precision, Inc. Products Division direct from our manufacturing facility located in Boylston, MA through our online shop at: Inspection Arsenal Shop. What is Inspection Arsenal’s return policy? If you are not satisfied with your purchase or the item(s) does not fit your application you may return it in its unused condition along with your packing slip within 7 days of receiving your order. No RMA is required. We will gladly refund you the entire purchase price of your items less shipping and 10% restocking fee. Please contact us if you have any questions. Order discrepancies must be reported within 2 business days after receipt of order. How can I become an Inspection Arsenal™ distributor? Please call 508-869-0373 for consideration to be an Inspection Arsenal™ distributor. Where can I download CAD drawings? CAD models for Inspection Arsenal™ products can be obtained by emailing your request using the form on the Contact page, or by calling 508-869-0373. Are custom sizes available for Inspection Arsenal products? Inspection Arsenal™ welcomes your requests for custom specifications. Please submit your RFQ through our website Contact page, or by calling 508-869-0373.
Who do I contact for technical support? Please contact our sales department with your question using the form on the Contact page, or by calling 508-869-0373. Our technical design department will call or email you to answer your question. What is the repeatability (true position) of the Loc-N-Load™ plates? True position test results internally show a deviation within .005. Internal repeatability tests show deviation of .0000-.0017 with an outlier of .0026 in the “Y” and almost no movement in “X” with only .005 as the highest deviation. What is the flatness of the aluminum plates? Plates are manufactured using MIC-6® with the following published flatness specification: “Flatness tolerance is maintained within .015” on ¼”-5/8” thickness (over a max of 8ft.)”. Can I get fixture design consultation for my repeat inspection jobs? Yes, send Phillips Precision, Inc. a sample part or a solid model. We will provide you with the appropriately sized Loc-N-Load™ plate and Inspection Arsenal™ Workholding. What is the hole pattern of the CMM traditional and Loc-N-Load plates? The hole pattern on the traditional plates is .5” and on the Loc-N-Load plates is 1”. Will Loc-N-Load™ rails work with the bolt holes on my CMM machine? The slots in the rails make it easy to adapt to different bolt hole patterns on various CMM machines. Can I tell you the model of my CMM machine and have you figure out what I need? We don’t have a library of CMM machine specs, but if you send us the size of the CMM granite and the size of parts you typically measure, we can recommend the best layout for you. Can I order replacement work holding parts – are they available separately? Certain replacement parts are available. Please submit your request through our website Contact page or by calling 508-869-0373. What is the screw size of the button-head and thumb screws in the work holding kits? The screw sizes are 1/4-20 (Inch) or M6 (Metric). Can I get fixture design consultation? Yes, send Phillips Precision, Inc. a sample part or a solid model or fill out this design request form. We will provide you with the appropriately sized Loc-N-Load™ plate and Inspection Arsenal™ work holding. Why do I need to use tape if the video says “no glue or tape? Using double-sided tape allows users to affix the docking rail against the edge of the CMMs granite out of the probes travel. Counterbored slots in the rail allow the system to be bolted down to most granite bolt patterns. How will the magnets of Loc-N-Load™ effect my inspections? Regarding probe structure and mechanics: The Loc-N-Load™ plate system, and/or the magnetic v-blocks may disrupt the mechanical process of some CMM probe bodies. There are several known solutions if you find that your measurements are inaccurate or that your probe is behaving strangely. 1. Try using a longer probe (possibly with extensions) to keep the magnetic body outside of the field produced by the magnets. 2. Try rotating or reorienting the probe body to increase distance from the magnet(s). Regarding material composition: Carbide probe tip shanks have a somewhat ferrous composition, and are therefore affected by magnets. If measuring a magnet directly, it is to be expected that the probe will not function properly. However, internal tests on site showed differences of less than .001” in measurements between a high magnetism test and a low magnetism test. Carbide and ceramic probe styli were used for this test along with magnetic and non-magnetic v-blocks. Regarding magnetic pieces: The probability of your pieces becoming magnetic from simply sitting on the magnets is unlikely. If you see that your part has become magnetic, try using a demagnetizer or follow the steps listed above. What are the plastic Open-Sight&trade; plates made of and how precise is this material? The Open-Sight plates are made from 1/2" thick polycarbonate stock with a scratch-resistant coating. The flatness on this material varies but is within +/- .025" across a sheet per material specifications. Plates made in the same batch will have similar thicknesses. We cannot guarantee that all of the plates in your order will be from the same batch, so thickness could vary. For critical applications, leveling feet may be added to fixture plates. Please call 508-869-0373 for details. What size are the holes, and how far apart are they? The holes for the acrylic Open-Sight™ plates are .5 spacing and 1/4-20 thread. Is there a viewing window as the one in the web page shows? Yes, the viewing window and the numbering and lettering on the sides are as shown in the picture on the website.